His Highness Sheikh Mohamed bin Zayed Al Nahyan, Crown Prince of Abu Dhabi and Deputy Supreme Commander of the UAE Armed Forces, today received members of the committees of the Host Town Programme for Special Olympics World Games- Abu Dhabi 2019 who were accompanied by Hessa Essa Buhumaid, Minister of Community Development, the chair of the heritage and community committee of the supreme committee for hosting the Games. His Highness Sheikh Mohamed welcomed the committee members, and urged them to double efforts to ensure the best possible organisation of the global event in a way that reflects the grand reputation now boasted by the UAE at the global scene and its endeavours to include and integrate People of Determination in society in conformity with international standards. The delegation, comprised of over 100 committee members, expressed appreciation to Sheikh Mohamed for the support provided to the Programme which is premised to promote the quintessential Emirati values and efforts to include and integrate the People of Determination. For her Part, the Minister expressed her sincere efforts to the country's wise leadership and commended the support provided by Sheikh Mohamed to the global event. "Hosting the Special Olympics World Games reflects the UAE vision supporting the inclusion and integration of the People of Determination in society," she said, adding that the Host Town Programme recalls the noble values established by late Sheikh Zayed bin Sultan Al Nahyan. "We in the UAE are looking forward to welcoming more than 7,500 athletes from all over the globe and introduce to them the essence of the UAE human civilisation across all fields." The Host Town Programme has been part of the Special Olympics World Games, but it was first introduced to a regional Games in IX MENA Games. The programme leverages an opportunity to raise awareness about the UAE vision to create inclusive and unified communities, making the UAE an excellent example of a nation that chooses to include. The programme offers the opportunity to the delegations to enjoy Emirati hospitality, customs and traditions. It also creates public awareness of intellectual disabilities and promotes the Special Olympics spirit all over the UAE. Additionally, it helps familiarise athletes with their new environments before starting competitions through sports, cultural, artistic and community events. 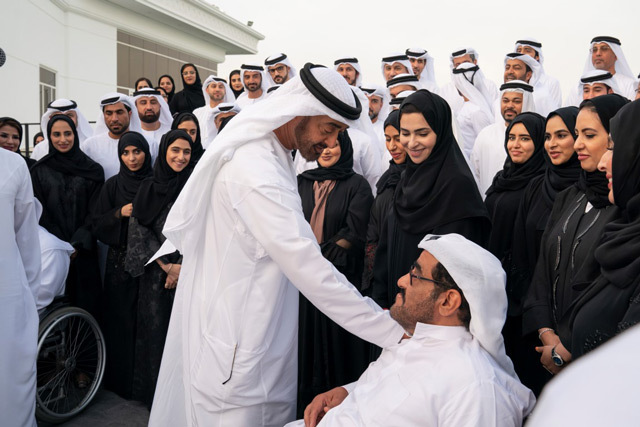 It will provide Special Olympics athletes with a chance to experience the Emirati culture and hospitality while in turn providing every citizen of the UAE a life-changing and memorable experience with Special Olympics athletes. Attending the meeting were H.H. Sheikh Abdullah bin Rashid Al Mu'alla, Deputy Ruler of Umm Al Qaiwain, H.H. Sheikh Tahnoun bin Mohammed Al Nahyan, Abu Dhabi Ruler’s Representative in Al Ain Region, H.H. Sheikh Saif bin Mohamed Al Nahyan, H.H. Sheikh Nahyan bin Zayed Al Nahyan, Chairman of the Board of Trustees of Zayed bin Sultan Al Nahyan Charitable and Humanitarian Foundation, and H.H. Lt. General Sheikh Saif bin Zayed Al Nahyan, Deputy Prime Minister and Minister of the Interior.